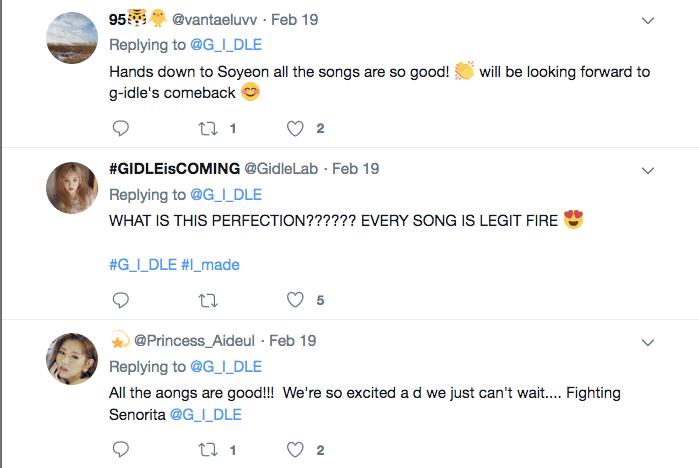 (G)I-DLE have released the audio snippet for their upcoming second mini album ‘I Made’, giving fans a taste of what they can expect. The album will consist of five tracks, including the title track ‘Senorita’, ‘Whats Your Name’, ‘Do Not Say’, ‘Give Me’, and ‘Blow Your Mind’. All members of (G)I-DLE participated in the creation and production of the new album, hence it’s name ‘I Made’, making it all the more special for both the group and their fans. The album is set to release on various online music sites on the 26th of this month at 6 PM KST. Listen to (G)I-DLE’s audio snippet for their 2nd mini album ‘I Made’ below! What do you think of the tracks? Which is your favourite? Let us know in the comments below! Keep following Officially Kmusic to keep up with the latest in music news!